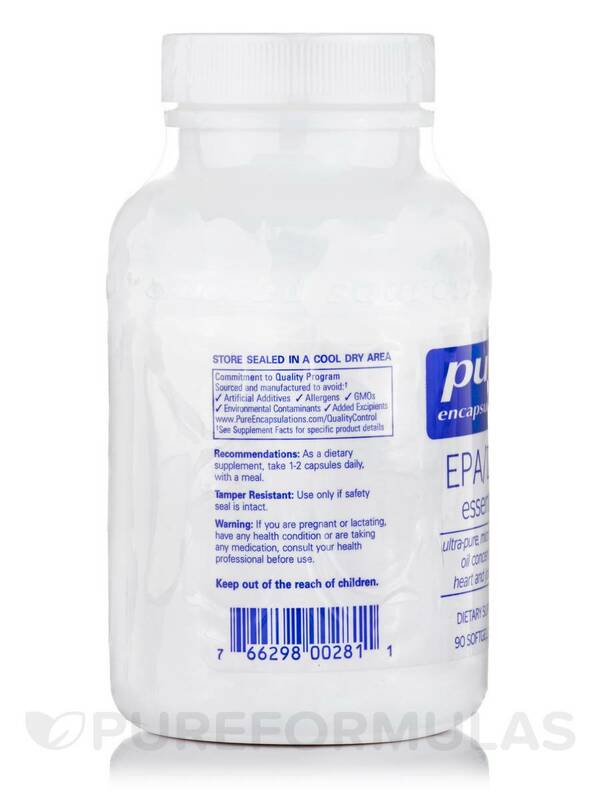 EPA/DHA Essentials by Pure Encapsulations is a very clean fish oil. I take EPA/DHA Essentials by Pure Encapsulations daily. My joints feel better. 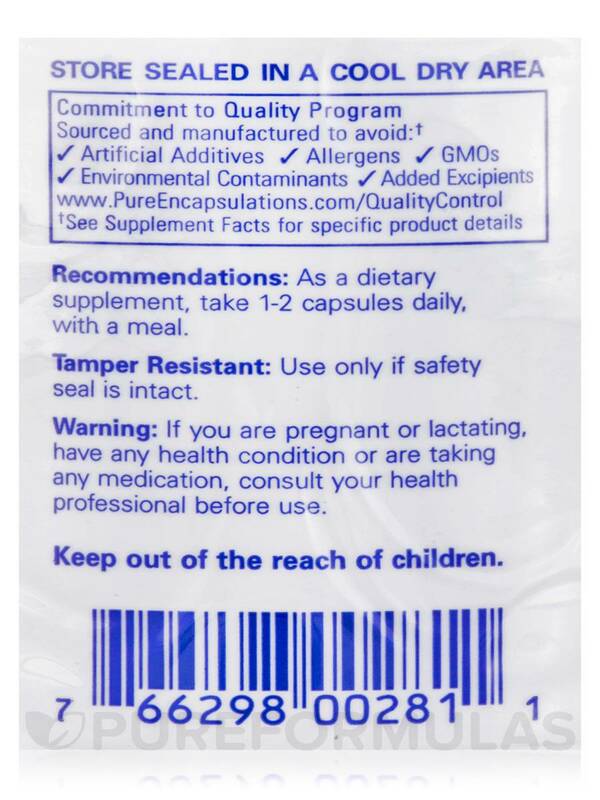 The EPA/DHA Essentials - 90 Softgel Capsules is easy to swallow and no 'fishy' after taste. Fish oil is widely known for its potential benefits. For example‚ it may promote joint comfort and connective tissue health by working to maintain the healthy production of leukotrines and prostaglandins. Your cardiovascular system may also benefit from EPA and DHA through their potential support for healthy platelet function and blood flow. Omega-3 fatty acids may be most renowned for their potential to support brain functioning. They are considered important to memory‚ cognitive health‚ and better mood and emotional health. DHA and EPA serve as components of neuronal cell membranes. Furthermore‚ fish oil promotes vascular health‚ which can support the delivery of both oxygen and nutrients to the brain--without fuel‚ it can't function effectively! A supplement like EPA/DHA Essentials by Pure Encapsulations may be helpful when you are unable to eat sufficient amounts of the oily‚ fatty fish that are good dietary sources of omega-3s. EPA/DHA Essentials is a convenient source of EPA and DHA‚ the two primary forms of omega-3 fatty acids‚ to maximize the usefulness of this product. These softgel capsules contain ultra-pure‚ molecularly distilled fish oil concentrate. This concentrate has been tested for microbal contaminants‚ oxidation‚ rancidity‚ heavy metals‚ PCBs‚ furans‚ and dioxins--as a result‚ you can rest assured of its high quality! Every softgel capsule contains a total 1‚000 milligrams of fish oil concentrate from herring‚ sardines and anchovies‚ including 300 milligrams of EPA (eicosapentaenoic acid) and 200 milligrams (docosahexaenoic acid). In addition‚ EPA/DHA Essentials also contains vitamin E to further promote absorption. Take two softgels daily‚ in divided doses with meals. 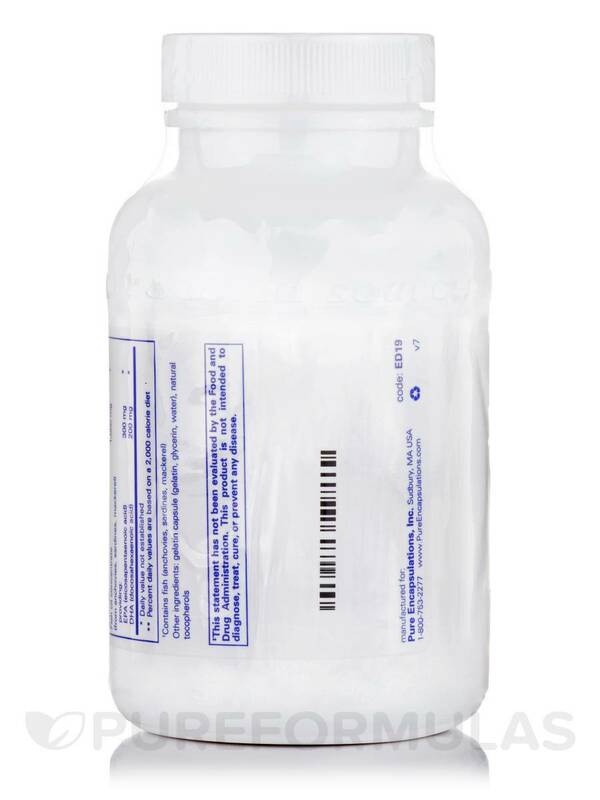 At the recommended dosage‚ each 90-softgel bottle of Pure Encapsulations' EPA/DHA Essentials should last for about 45 days. Other Ingredients: Gelatin capsule (gelatin‚ glycerin‚ water)‚ natural tocopherols. Contains Fish (Anchovies‚ Sardines‚ Mackerel). 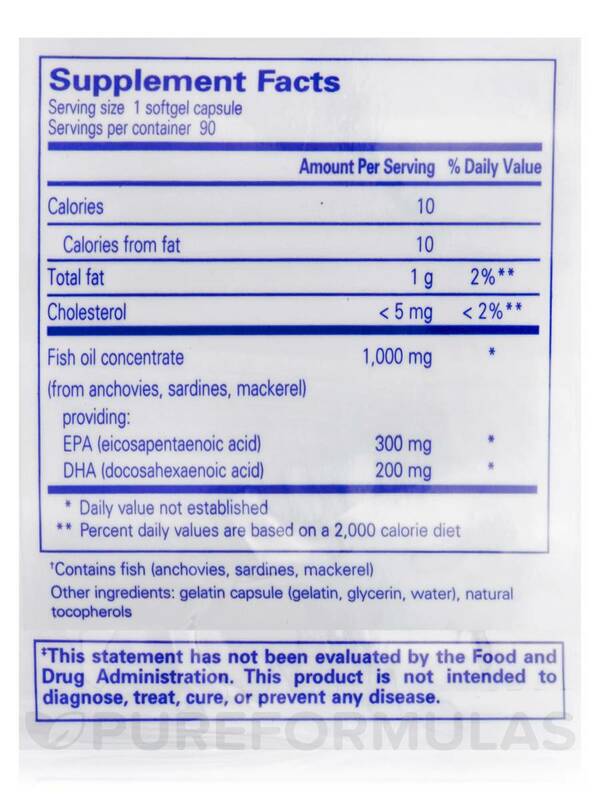 Allergen Caution: Contains Fish (Anchovies‚ Sardines‚ Mackerel). Very easy to take and I trust this brand. I have complicated health issues (Lyme) so I can't say that I noticed a difference taking this, but I know it's extra support my body needs. Easy to swallow. Only 1 capsule a day. I like the effectiveness of EPA/DHA Essentials by Pure Encapsulations. We thought about returning the product, but opted to puncture the capsules instead. The flavor is not great as one could imagine. Size matters, the capsules are a little too large to swallow. Easy to swallow. Quality ingredients. EPA DHA Essentials by Pure Encapsulations is great so far! Great product, no fishy after taste. 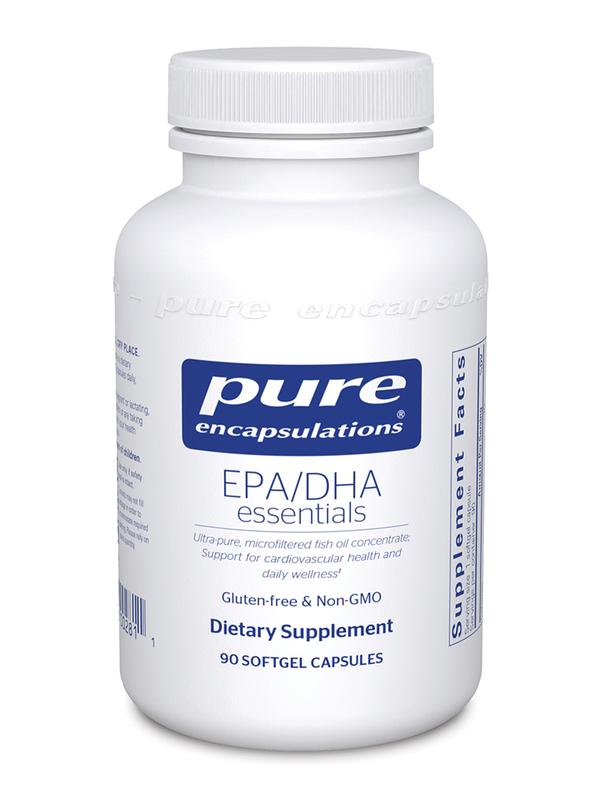 EPA DHA Essentials by Pure Encapsulations is excellent for brain health. Since I buy my other supplements from PureFormulas and I am pleased with their products I knew this one would be good too. I've been very pleased and feel my brain is healing. Great product with fast results. Helps hair, skin, and small aches and pains! I'm very pleased with the purity and overall effectiveness of Pure Encapsulations products in general, and EPA/DHA Essentials in particular. The "other ingredients" are kept to a minimum, which is very important to me. No preservatives or flavorings. Do these capsules contain any mercury? Thank you for reaching out to us, Libia. No, this product does not contan any mercury.